This is a "must have" album on the "must have" version. - Michael Fremer, Music 10/10, Sound 10/10! Recorded in 1968, The Band’s Music From Big Pink stems from the same locale—a pink farmhouse in upstate Woodstock, New York—as the Basement Tapes and is just as rustic, timeless, and mysterious as Dylan’s celebrated work. 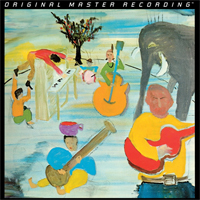 Half-speed mastered from the original master tapes and pressed at RTI, Mobile Fidelity's analog version practically gives you a spot on the floor at Big Pink as the sessions went down. Curl up, close your eyes, and listen as the music's sublimely organic sounds appear with full-range dynamics, life-size imaging, and tremendous soundstaging. This is one of the reasons why you have a turntable. Prepare for your system, and your ears, to glow. "So finally, after all of these years we have the penultimate Music From Big Pink. It's got the bass, it's got the proper top end, it has the mids correct and it gives you all of the space and low level detail missing from every other edition, though the original Capitol isn't bad in that department. This is a "must have" album on the "must have" version. Mobile Fidelity has had its share of hits and misses. This is one of the hits. Don't miss it." - Michael Fremer, Music 10/10, Sound 10/10!